As you know, today is supposed to be the day of the Rapture. As you also probably know, May is Zombie Apocalypse Awareness Month. Odd that these two events should fall at the same time, but fitting I suppose. Honestly, how else would you like to be Raptured? I enjoy the challenge of having to face down hordes of zombies just to make it to October. Wait a minute! What am I talking about? Where does October fit into all of this? Well, that is the month that all the turmoil from the tribulations is supposed to end and a thousand years of heaven on earth will begin. At least, that’s my understanding of it. If you want to learn more about what the Rapture and the Tribulations mean and what to expect if you aren’t raptured, check out this site that has ALL the information you could possibly need; The Latter Rain. It has time-lines, and biblical verse with explanations of verse meanings (as *they* see it), and even an article on how to prepare for the latter rain… And, yes, there is an in depth explanation of what the latter rain is too. (The third phase of spirituality on earth or something like that.) You can also check out this site if you like. Okay, now that I’m done sharing the addresses my husband found a couple of weeks ago, let’s talk about the zombies. 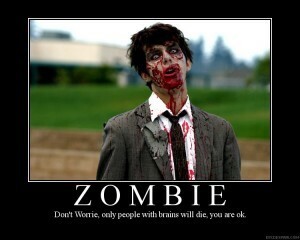 Yes, zombies. I’m all for a Zombie Apocalypse if there is going to be a Rapture! Seriously! It will really make things interesting. I mean, things will be interesting anyway since there’s going to be a worldwide earthquake and a bunch of people are going to suddenly disappear at 6:00 pm (who knows if it’s central, or Greenwich Mean Time? ), but I’m talking about the five months to follow. You know you’ve taken the quiz that tells you if you’ll survive the Zombie Apocalypse! (You don’t have to admit it to me, but you and I both know, you’ve taken it!) Who really will survive? The resurrection of the believers occurs at the time of the Rapture (1 Thessalonians 4:16-17) so we know the resurrection of the unbelievers must occur near that time or shortly thereafter. This verse doesn’t say that the unsaved will be resurrected to any kind of life or conscious existence. The punishment for mankind’s rebellion is spiritual death. There is no indication in the Bible that the dead unbelievers will once again be brought back into conscious existence. Hello? Do you see what I see? ZOMBIES!! I’ll tell you what, I’m looking forward to seeing me some real life zombies *if* the Rapture happens. The CDC lets you know how to ready yourself for this epidemic. 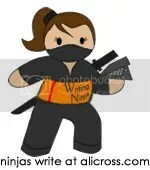 Sonia G Medeiros blogs about getting fit to fight off the hordes. Should the CDC fail, try checking out this list. It includes Ving Rhames. This entry was posted in Life, zombies. Bookmark the permalink.